Helpy has the ability to receive email at your support email addresses and import the messages as tickets in the web interface. Whenever you or the user replies to the email thread, Helpy captures the discussion and sends out messages accordingly. Please note: Customers of Helpy Hosted DO NOT NEED TO DO ANYTHING. Email is preconfigured to use our servers. To do this, Helpy uses a third party email service provider to parse inbound messages and POST them to a specific URL. To send outbound mail, Helpy uses a standard SMTP server, which you will need to provide the configuration for. 1. Click "Yes" to enable outbound email. 2. 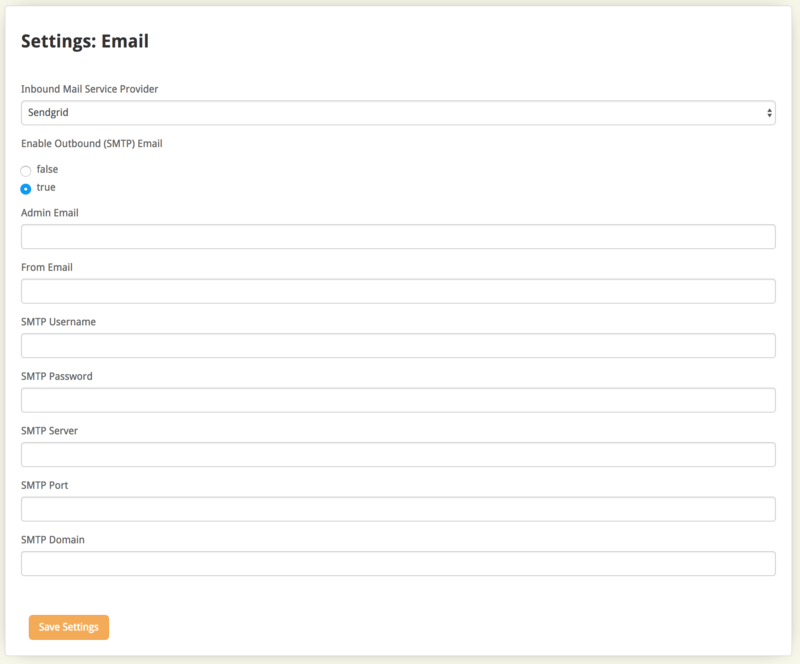 Enter a real email address in the admin and from email fields. This is the address that system sent emails will use as a from address. 3. Provide the login credentials for your SMTP server.